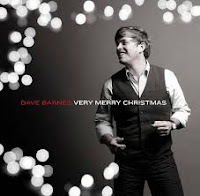 It’s safe to say that no one can question the unrestrained Christmas spirit of soulful singer/songwriter Dave Barnes. He has made five hilarious “Dave Barnes Christmas Extravagan Za” videos, he performed a holiday stand-up comedy show last December in Nashville and this year he has released a full length Christmas album, Very Merry Christmas. Balancing familiar classics with meaningful originals, Dave has crafted a holiday album of mellow, bluesy acoustic numbers that effortlessly shifts between reflective and romantic. The comfortable musical vibe is carried by Dave’s expressive voice and his folky/jazzy guitar playing. His lyrics have a real warmth to them and they are drenched in relationships, whether it be with family, God or that special someone. In fact, there’s such a “musical mistletoe” feeling to most of the songs that the album could’ve been called Very Merry (Baby’s First) Christmas or at least come with a miniature stocking option in the pre-order packages. Whether it’s in Dave’s sly winking vocal delivery or the smooth musical moods he creates, the “cozy up” vibe can be clearly felt throughout Very Merry Christmas. “Christmas Tonight,” sung with Lady Antebellum’s Hillary Scott, is a playful back and forth duet in the vein of “Baby, It’s Cold Outside” that shows compliments and persistence can win out over holiday obligations. “Meet Me At The Mistletoe” conveys that feeling of being in room full of people and wanting to steal away for a special moment with your sweetheart. “Holiday Made For Two” has a guitar riff and a wooing lyric that both sound like they could’ve been on a Marvin Gaye outtake. Dave’s cover of Mariah Carey’s “All I Want For Christmas Is You” is redone with a deliberately looser beat and sung with a confidence that makes the song have more of an endearing plea to it. Even when taking on standards like “I’ll Be Home For Christmas” and “The Christmas Song,” Dave uses a relaxed, R&B approach that makes the songs feel a little more amorous than they usually do. In my opinion though, when you’re snuggling up to your own Mrs. Claus, the more songs the merrier. Dave also touches on some other important connections to be made around the holidays, including getting together with family (“Very Merry Christmas”), thinking back and looking forward (“Family Tree”), being mindful of other people’s needs (“I Pray On Christmas”) and he even writes a modern take on the story of Jesus’ birth (“Mary and Joseph”). As clichéd as it sounds, Very Merry Christmas does an incredible job of speaking to both your heart and your head. When the album ends, you’ll most likely find yourself in an oddly appreciative mood that will have nothing to do with presents or possessions, but everything to do with friends, family and faith. You’ll be thankful for love in all its various forms, thankful for Christmas and all that it entails and thankful that with all the “come hither” sentiment on Very Merry Christmas, there’ll be no need to spike the eggnog.